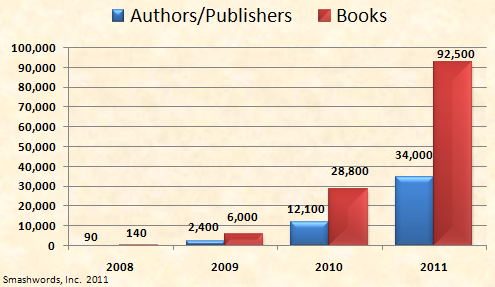 2011 was another strong year for Smashwords and our authors. We're ending the year with over 92,000 titles published, up from 28,800 at the end of last year. In my 2010 year in review post, 75,000 was my stretch goal for this year, so we beat it by a good margin. Smashwords today supports over 34,000 authors and small publishers around the world, up from 12,000 a year ago. I launched Smashwords four years ago with a crazy idea to change the way books were published, marketed and sold. I believed authors should have the freedom to publish directly to their readers without the interference of publishing gatekeepers. My ideas were not unique. The great Dan Poynter has been evangelizing the virtues of self-publishing for over 30 years. I’d like to think we’ve helped bring Dan’s vision to life. Smashwords married self-publishing with ebooks, and we did it with a free platform that enabled any writer, anywhere in the world, to easily publish an ebook using nothing more than a word processor. We took the printing press – once under the sole dominion of the publisher – and put it in the cloud for all to use. Unlike publishing services that earn their income by selling paid services to authors, Smashwords doesn’t sell services. Smashwords earns income only if we help sell books. We earn a small commission on sales equal to 10% of the list price for distributed books, and 15% of the net for books sold at our Smashwords.com retail operation. We think our approach aligns our interests with the interests of authors. The more we help you sell your book, the better we all do. What started as crazy dream has become a reality. We've created a business that empowers authors to reach readers with their words. 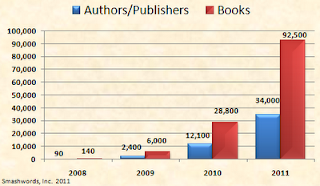 Smashwords authors collectively earned millions of dollars in 2011. More importantly, we've helped tens of thousands of authors enjoy the freedom to publish and get read. When we launched in early 2008, many writers viewed self-publishing as the option of last resort. Self-pubbed authors were often ridiculed as "vanity" authors, and much of the most vitriolic criticism came from fellow writers. We don’t hear much of that anymore. Self-publishing is finally earning the respect it deserves. Today, self publishing is the option of first choice for many first-time authors. Previously published authors - the backbone of Big Publishing, are also wading into the indie waters. Most start with their reverted-rights works. Then they catch the indie bug and release unsold works, and then they move on to original first releases. You might think of it as a graduated progression toward enlightenment that starts with baby steps before the big leap. More will take those first steps in 2012, inspired by other successful indies, possibly inspired by you. I think few people in the traditional publishing industry comprehend how this indie author revolution will transform their business in the next few years. Their world is about to be turned upside down. Unfortunately, when faced with simultaneous convergence of multiple big trends (the rise of ebooks, the rise of the indie authors, the shift of bookselling from brick and mortar to online), most big publishers have taken actions counterproductive to their own self-preservation. They're trying to grab author rights they don't deserve. They're trying to the hold the line at 25% net royalties for ebooks, which works out to a paltry 12-17.5% of list. That line can't hold when authors can earn 60-80% list by self-publishing, and enjoy better distribution. The power of publishing is shifting from large publishers to authors. It's what I’ve predicted for four years, and now the trend is plain as day for anyone who chooses to see it. What happens when authors lose faith in Big Publishing? This was the subject of my blog post earlier this year, Nietzsche and the Downfall of Big Publishing, inspired by what I thought were interesting parallels with the Arab Spring. 2011 was the year indies proved they can out-publish, out-compete, out-distribute and out-sell the large publishers. Look no further than the bestseller lists at major retailers to see how the indie insurgents are scaling the lists. A few have even landed in the NY Times ebook bestseller list. We’ll see more of this in 2012. Indie authors, free of the legacy business practices and expense structures of the large publishers, are beginning to feel their oats. If the indie author movement was a person, it would just now be entering puberty. It's in that gawky awkward pimply stage of life. The participants are filled with unbridled optimism for the future, confident they're writing the new rules for the future (and they are!). Visit any writers message board and you’ll find writers plotting the future of publishing. Sure, the skeptical observer will find petty internecine squabbles reminiscent of high school, and copious uniformed opinions dripping with unfounded speculation, fear, greed, envy and aspiration. But dig deeper and you'll see something profound is happening. These newly fledged indie ebook authors (old timers are the ones with two or three years of experience) are piecing together the secrets of successful modern day publishing. They’re sharing information, debating, arguing and leading the revolution that is upon us. We're witnessing the rise of the indie author collective, and the collective - warts and all – is giving rise to an intelligence and sophistication that will redefine publishing for the better. The practice and professionalism of self-publishing grew by leaps and bounds in 2011 as indie authors collaborated. The best indie authors and small presses are publishing books of equal or higher quality than traditional publishers, and they're doing it faster, smarter and less expensively. Because the indies are earning 60-80% of the list price as their royalty, they're earning higher profits while producing a product that is more affordable and more accessible to more readers around the globe than ever before. As some lucky indies strike gold (and let’s be realistic, most indies do not sell well, just as most traditionally published books don't sell well), they share their secrets in real time and inspire all authors to raise their game. We're witnessing a publishing renaissance that will lead to more readers, more reading, greater literacy, and greater and more amazing published works than could ever have been realized under the old gatekeeping system. As I've often stated here and elsewhere, traditional publishers are in the business of selling books, not publishing books. They acquire books they think they can sell. Nothing wrong with that, unless you’re an author whose work is not perceived as commercial, or you lack the fame of an established platform, or you’re a reader who appreciates more choice at less cost. Writers write for reasons different than publishers publish, and it's at the nexus of these opposing motivations that the indie author revolution took root. Today’s indie ebook author is at the right place at the right time. Print is in decline as reading moves to screens, brick and mortar fades, and book buying moves online. In the old world of two or three years ago, publishers controlled the printing press and access to distribution. Today, thanks to free ebook publishing and distribution tools like Smashwords, the printing press is free and available to any author, and distribution is open to all. Retailers such as Apple, Barnes & Noble, Sony, Kobo, Diesel and Amazon deserve a lot of credit for welcoming indies to their virtual shelves. These ebook retailers are hungry to carry the books of indie authors because these books satisfy their customers (they sell). Retailers also understand that readers could care less about the name of the publisher on the book’s virtual spine. The implications of this revolution are profound. Writers are now in charge. The writer decides when their manuscript graduates to published book. Readers decide which books are read. Along with this power shift also comes the responsibility for authors to honor the best-practices of the best traditional publishers. Readers have little tolerance for anything less, and this is how it should be. In this age of abundance where consumers have unlimited access to myriad high-quality sources of entertainment and knowledge - much of it accessible for free - writers need to up their game. Those who honor the reader by publishing great books will reach the most readers. Book marketing has always been a word of mouth business. If you write a book that touches your reader’s soul, or inspires them with passion or knowledge, your readers will market your book for you. There's never been a better time to be a writer. The opportunity to reach readers with words has never been greater. Against this backdrop, you might understand why I’m so excited about the future I see for Smashwords authors and publishers. Our business is dedicated to helping authors stake their rightful claim to this bright future. If I were to sum up our focus in 2011 in one word, that word would be infrastructure. Smashwords has been profitable for 15 months. We're reinvesting these profits to build a solid foundation upon which we’ll deliver continuous service enhances to our authors, publishers and retailers for many years to come. Our development roadmap calls for over 500 minor and major service enhancements. Some are so minor you might not notice them. Others we think will knock your socks off. The Smashwords you see today barely scratches the surface of what we think is possible. The bulk of our development effort this year focused on building a scalable technology infrastructure that can support one million or more published and distributed books (or, about 10X our current size). To enable this future, we invested heavily in infrastructure. Much of this infrastructure build-out is invisible to users, and if we do our job right it remains invisible. You don’t care how we build it, you just want what we build to work for you, whether you're an author, publisher, retailer or reader. 1. People - There are real people behind Smashwords. 12 months ago, we were barely three employees. Today we're 13. We've got a great team here in California, all of whom are dedicated to serving our authors, publishers, retailers and customers. We value every client. 2. Platform infrastructure - We completely rearchitected the underlying Smashwords platform this year to improve scalability, reliability, performance and security. As one of the Twitter founders once said, developing a fast-growing web service is akin to rebuilding a rocket ship in mid-flight. I grok that. The Smashwords platform has a lot of complex moving parts. Most of our last six months of development work has been focused on this infrastructure under the hood; the nuts, bolts, gears, glue and magic that hold our systems together. Most people never think about infrastructure except for when it fails. The proof in our pudding: Our infrastructure improvements have led to fewer website outages and faster page load times at the same time our catalog of books and traffic have exploded. 3. Distribution - We revamped our technical integrations with our retail partners so our books can flow to them faster and more accurately than ever before. Most of our retail partners also upped their games to accommodate our incredible increase in title volume. This is not to say everything is perfect. It is not. We view distribution as a never-ending work in progress, and we will continue to work in a constructive manner with all our retail partners to explore how we can improve our mutual performance. 4. Meatgrinder - We completed multiple updates to our Meatgrinder conversion engine, both in terms of scalability and also capability. On the scalability front, earlier in the year Meatgrinder was taking up to 30 hours to convert a single ebook. We tripled conversion capacity and now complete most conversions within three minutes. On the capability front, we improved Meatgrinder's ability to produce higher-quality books by adding greater styling control, automatically generated NCXes, and automatic error correction for some common formatting problems. 5. Categorization - We're in the final stages of a complete remapping of our categorization system to provide complete support for the latest BISAC categorization specifications. We're now supporting more categories than ever. Good categorization is a foundational element of what comes next in 2012. 6. Discovery - Multiple items here. Books aren’t purchasable unless they’re findable (or tripped over or stumbled upon or recommended by a friend or promoted), and that's where discovery comes in. We kicked off 2011 by adding support for long book descriptions (4,000 characters). We updated the shopping cart so it recommends up to 12 other books by the same author. In March, we launched the official Smashwords Facebook page which now gets thousands of visitors each week (thanks to the great volunteer efforts of Smashwords author John Low!) including many readers looking to discover new authors. In June, we acquired a block of 50,000 ISBNs from Bowker so we could give them away for free (ISBNs enable distribution to Apple, Sony and Kobo). 7. Reporting – We increased the frequency of our aggregated sales reporting from retail partners. We introduced a new downloadable spreadsheet that maps each quarterly payment to the sales behind that payment, and we made the data easy to query by author, retailer or title. For sales at Smashwords.com, we improved our email notifications so authors can more easily monitor more information about about their sales as they happen. Customers, too, now receive more complete purchase confirmations to help them access their books faster and easier. 8. Literary Agents – We updated our publishing platform so literary agents can now upload and manage the indie ebook efforts of their clients. 9. Globalization – On a percentage basis, most countries outside the US are just now entering the exponential growth phase. Their markets are where the US market was two, three or four years ago. Within a few years, the market for ebooks outside the US will dwarf the US market. We took a number of steps in 2011 to expand the global footprint of Smashwords ebooks. We signed an expanded distribution deal with Apple which increased our international coverage to Apple iBookstores in 32 different countries. Today, nearly half of our Apple sales come from outside the U.S (I’m surprised the media hasn’t picked up more on Apple’s impressive international success in 2011). We updated our payment and reporting systems to track VAT, which is handled differently by different retailers. Thanks to the volunteer efforts of Smashwords authors around the world, we released translated Smashwords Style Guides in German, French, Spanish, Italian (also the Smashwords Book Marketing Guide in Italian) and Dutch. A Bengali version is completed and a Danish version is in the works. 10. Smashwords Gifting - Our final big feature of the year launched on Christmas eve. We now make it easy for customers (and authors too, if they choose) to purchase ebooks as gifts. We think this is a nice complement to our popular Smashwords Coupon tool. 11. Competition - Many new ebook distribution competitors came on the scene in 2011. Back in 2008, we were the only game in town when we became the first ebook distributor to focus exclusively on self-published authors. Now you have choices. We feel honored that so many authors, small publishers and agents continue to choose Smashwords over the competition. The ebook market remains in an exponential growth phase. 2011 will probably show ebooks at 20% of the US book market, up from 8.3% the year before and 3% the year before that. Based on preliminary post-Christmas sales results I’ve seen for Smashwords books at Apple, B&N and Sony, I think 2012 could see ebook market share in the US rise to between 40 and 50%. I expect many more competitors will come online in 2012 and 2013. I've been in technology for the last 20 years, so I'm intimately familiar with the inevitable boom and bust cycles of things touched by tech (and I have the old scars to prove it). Ebooks are in the boom phase now, but they cannot continue the torrid pace of growth. The new competitors and the noise they create will draw more authors, books and readers into the market, and will act as a growth catalyst for a couple years. When the exponential growth ends and the bust comes (and yes, it will come), some of these new competitors will disappear. Any one of us could disappear if we fail to build profitable businesses that add measurable value to those we serve. In 2011, the most formidable competition came from Amazon, which has been on a multi-year rampage to disintermediate anyone or anything that stands between Amazon and their target customer. Three weeks ago Amazon launched KDP Select, a new opt-in service that represents their boldest broadside yet aimed at competing ebook retailers. KDP Select requires participating authors to remove their books from all retailers except for Amazon. I blogged why I think KDP Select is bad for authors (here and here). While most Smashwords authors share my view that exclusivity is a dangerously slippery slope to trod, thousands of authors enrolled titles in the Amazon program before Christmas. Of the approximate 65,000 or so books enrolled in KDP Select, nearly 6,000 books came from - and disappeared from - Smashwords as a result. Despite the punch in the gut from Amazon, we still managed to grow our title count during the month of December (now over 92,000 titles), albeit at a lower rate of growth than we’re accustomed. Preliminary holiday sales results indicate our remaining authors enjoyed an impressive sales bump in the first few days following Christmas at Apple (up over 70%), Barnes & Noble (up over 100%) and Sony (up 30%). I don’t yet have results from Kobo and Diesel. If the record-breaking post-Christmas bump follows the same pattern as last year, sales will moderate a little in the next two weeks and then stabilize and begin growing again at a new normal that’s measurably higher than the pre-Christmas sales levels. These strong holiday sales, and the tremendous growth we’ve seen this year both in the US and internationally only solidify my conviction of the importance of authors maintaining broad and diversified distribution. Every retailer – even the smallest – works to introduce authors to new readers they wouldn’t reach otherwise. Yes, distribution is our business so my view is biased. I believe in the value of retailers and the distributors who serve them. Someday, if the Amazon powers see fit, we’ll distribute more of our titles to them as well (we’re currently distributing about 200 titles to them). We’d much prefer to engage with Amazon as a partner rather than as adversary. We think we and our authors can help make their business more successful, just as we’ve helped our existing retailer partners grow their businesses. A good distributor helps retailers ingest and list more titles more efficiently and at less cost than operating their own self-pub platforms. What's Coming to Smashwords in 2012? Smashwords is an ebook distributor, so our priorities will be guided by this focus. Service enhancements will concentrate on making our books more available and more discoverable by readers. In 2012 we’ll shift more of our attention from backend infrastructure to customer-facing user experience. The new features and service offerings will leverage the new infrastructure foundation we built in 2011. Discovery – We’ll complete the BISAC recategorization mentioned above very soon, and from there we’ll turn our attention to our Smashwords.com retail operation and give it some much overdue love and attention on the discovery front. We’ll add more search options to the Smashwords home page, more alternative discovery paths to help readers find books they'd enjoy reading, and we’ll revamp the algorithms driving our best-seller lists so they more accurately reflect the collective intelligence and reading preferences of our customers. Once that initial stage is completed, we’ll leverage some of these new features on a couple secret projects that might surprise some folks, one of which will help our retail partners identify Smashwords books that deserve extra promotion. More Distribution - We'll add more distribution outlets in 2012, the first of which we'll probably announce in the next two months (working on the technical integration now). Faster Distribution – We currently ship to retailers once a week. In 2012, we’ll phase in more frequent shipments to those retailers that can support it so books appear faster and metadata changes reflect faster. This will give authors greater control over their distribution. Faster Reporting - Some Smashwords authors have already noticed that we've increased the speed and frequency of retailer sales reporting over the last two months. We will continue to make incremental progress here for the retailers that can support it. Faster Premium Catalog Approvals - There are two variables influencing Premium Catalog approval times. The first variable rests with the author or publisher, and that's the responsibility to upload a book that's formatted to the Smashwords Style Guide. A well-formatted book gets approved on the first review. We'll continue to improve the Smashwords Style Guide and other resources to help make it faster and easier for authors to format their books. The second variable is on our side, and that's the vetting process where we manually review each title for adherence to the Style Guide and the Smashwords Terms of Service. We've added two new recent hires to the vetting team and will add additional staff in the new year as required. The goal is to get approvals down to under three days. The faster the approval, the faster we can distribute you to retailers. In addition to throwing people at the challenge, we'll also continue to develop new automated tools to accelerate the process. More Control - There are several planned features related to providing authors greater control over more aspects of their publishing, distribution and metadata. One such feature planned for the second half of 2012 is Smashwords Direct, which will give authors the option to upload their own pre-formatted .epub files (and other formats) if they choose. Also look for greater control over foreign currency pricing. As another fabulous year draws to a close, I want to express my sincere appreciation to every Smashwords author, publisher, reader, retailer and service provider partner (shout out to the awesome pros on my “Mark’s List” who help their fellow indies with low-cost formatting and cover design services). We created this for you. With your trust, confidence and support, we will continue to serve you. When you utilize our distribution services, you’re directly supporting our mission to reshape book publishing for the benefit of authors and readers everywhere. Happy New Year, and safe holidays. Peace all. My thanks to the Smashwords' staff for all they've done this year. It's deeply appreciated. I look forward to 2012 with enthusiasm! I couldn't have realized my dream without Smashwords, and it's far easier than I ever imagined. Thanks to Mark and all the staff for making 2011 so fantastic and may all indie authors know great thrills and oodles of readers in 2012! As with many others, my dreams of being a published author would have died long ago had Smashwords not come into being as it did. My heartfelt gratitude to Mark and the Smashwords team for helping me realize this dream. I've been with Smashwords from way back. Have to say, what has happened here has been nothing short of miraculous for us Indies. For my books (of which I have 17) from Jan 2011 to Dec 2011, royaties at Smashwords rose nearly 300% while at Amazon, with my books selling at the same price point, fell 210%. All I can say is, Thank You Mark and your team for making it all possible. Thank, you Mark! As a traditionally published author and as a self-published e-book author, Smashwords has opened a new world for me. Book sales are increasing (non-fiction, while not experiencing the explosive growth of fiction, is still growing). I'm excited to own my career in a new way. And I have found that since I have been following Smashwords blog (published my first Smashwords book on 9/11/2009) I have found that your insights have proved prophetic. Looking forward to publishing more with Smashwords in 2012. Also looking forward to quicker reporting, new distribution partners, more discoverability, and international sales. This has been an amazing year for me, and Smashwords is a huge part of that. Thank you for all you've done, and continue to do, for Indie writers. Happy New Year to you, Mark, and to all at Smashwords. Many thanks as you gave my two previously novels, A Brownstone in Brooklyn and Philly Style and Philly new life. Thanks to you Mark and your staff. 2011 was an excellent year for eBook sales I predict that eBook sales during 2012 will double over 2011. My next eBook publication with smashwords will be REGENERATION: inborn, the sequel to "Vitruvian Man." Have an excellent New Year celebration. Many Thanks for All efforts on our behalf. Thanks Smashwords. Thank you Mark and Smashwords for helping me become a bestselling author. Thank you for making it easy to earn and give my inspirational titles to readers who can afford them and those who can not. Happy New Year. I am anxious to see what happens for all of us in 2012. Thanks for creating and taking the chance on this crazy idea you had all those years ago. I will be putting samshwords to good use soon. "When we launched in early 2008, many writers viewed self-publishing as the option of last resort. Self-pubbed authors were often ridiculed as "vanity" authors, and much of the most vitriolic criticism came from fellow writers. We don’t hear much of that anymore. Self-publishing is finally earning the respect it deserves." You said it well, Mark, and I say it was about time self-published authors received respect for their work. I argued that for nearly a decade. Thanks for the opportunities you've given authors. I joined Dec. 29, 2009, so I just had my 2 year anniversary at Smashwords and I'm so glad I gave it a shot. Happy New Year, Mark and the team. Thanks for a great year and for the many more to come. It's been a great partnership, as my 30 Smashwords titles demonstrate. Smashwords rocks! And thanks for sharing a little behind the scenes report of what is coming. Thanks to the Smashwords crew for all you do to support independent authors! My wife and I experienced an explosion in our ebook sales during 2011 and we look forward to more expansion in 2012. Happy New Year, Mark and staff! What you are doing for Indie authors is awesome in the extreme. Best of luck in all of your future endeavors and thank you for giving is this platform. Wow, quite a mouthful. And interesting. Thanks for the overview! From the short time I've been with SW (this March), I've seen huge progress and nice checks coming my way. Continued success for all of us. Thanks for listing all the reasons why I chose to publish with Smashwords. We're all going to have a great year because of your efforts to give indie authors control of their work. Hi Mark, great report. Thank for the wonderful platform you provide for us to publish our works. I wish you great success in 2012 and hope you open more avenues for us indie authors to distribute down. How about cracking Google Books so we don't have to go through that hateful interface? Without Smashwords my work would of never left my computer and I never would of traveled down the road of self-publishing. I try to support SW and in that vein, I have decided to not jump on the KDP bandwagon, although many authors I know have, and have dramatically increased their Amazon sales as a result. However, I think one issue that will discourage readers from using SW over Amazon or B&N, for example, is the ease at which those sellers buyer can seamlessly download books to their devices. I think SW needs to develop an application that will at least mimic this delivery to the devices through pcs, macs, and androids, where the only extra step that may need to be taken is that the ereader is attached to device to which the ebook gets downloaded either during the download or after with sutorun. As a longtime Smashwords author, I've noted and appreciate the work you've put into the platform. I credit you for crashing the gates to the kingdom and giving people like me a chance to get our work out there. Thanks for all you do, and if you ever set up a speaker's bureau of Smashwords authors, count me in. I'm just up the road in San Francisco. Thanks for SW team for creating such a platform for writers to publish and distributing their work. Thanks also for sharing the news periodically about what is going on at smashwards. 2011 was a fantastic year distributing through Smashwords, and I'm even more excited about 2012. You say you're distributing 200 titles to Amazon: Why only 200? Were they the bestselling 200 on Smashwords at the time and Amazon were testing the water? I'm not knocking the idea (I also publish on Amazon) but I think it would be easier if we could ALL do it under the Smashwords roof. Smashwords has been vital in helping me develop my publishing business. I am able to convince our authors that an ebook should be the first step - don't waste a tree until you test the waters. The whole Smashwords concept is great and thank you, Mark, for sharing your thoughts on where you wish to take the operation over the coming year. It's a big comfort to small business operators like myself who rely so heavily on the Team's services, not to mention inspirational. I have to admit to being highly excited about the thought of Smashwords Direct - this will save a lot of multiple formatting. Congratulations all, and keep up the good work - so many of us really appreciate it! I uploaded my books to Smashwords a year ago and have never looked back. Thank you for providing such an amazing service to authors. Looking forward to a great 2012. Would you say that the e-book revolution is now at same stage as the Personal Computer revolution was when the choices got narrowed down to Apple and MSDos? The choices now being ePub and Kindle -- except, interestingly enough, Apple, this time around supports the non-proprietary format. I can sense the passion in Smashwords. Good luck and well done - because of Smashwords, I m now an inide author and publisher. 6 months ago i wouldn't have know what the word 'indie' meant, and now I am one of them. Great feel. I'm excited about these new Smashwords developments! The WHO sang "Got a feeling Twenty-One is gonna be a good year, especially if you and me see it through together". On that note, I'm singing, "Got a feeling Twenty-Twelve is gonna be a good year...."
Not only is your service excellent, but your Style Guide has helped me understand formatting in so many helpful ways. @jambalian - Yes, you and many Smashwords authors would prefer to centrally manage distribution to all retailers through Smashwords. Unfortunately, Amazon has not yet made this possible. Amazon has declined to provide us agency terms as they do for the big 6 publishers, and since they won't allow it we're unable to distribute our titles to them using the same automated systems that support bulk uploading/updates that Amazon provides to the Big 6. Every other Smashwords retailer provides us agency terms (so authors/publishers can set price) and bulk upload/updating systems. Amazon has publicly stated previously that they plan to create a bulk upload system for their KDP Direct platform, but they have delayed implementation of this multiple times. In the meantime, as an experiment we upload a few dozen titles manually to the KDP platform on behalf of a small number of Smashwords authors (and Amazon also kindly ingested about 200 Spanish-language titles the other month from us), but because it's the same slow manual process that any author using their platform goes through, it's not yet feasible for us to scale this out to all 33,000+ Smashwords authors. Until Amazon introduces their bulk upload system, we'll limit the Smashwords distribution to them to a small number of better selling SW titles because otherwise it's just not feasible. Exciting, very exciting! My promotional machine has been in high gear the last ten days. Hyperlinks are weaving the digital shelves. Happy New Year! An incredible and pioneering journey! Smashwords has been a real leader in indie publishing and ebook distribution. Maybe its time to add a further string to the bow by becoming a leading worldwide ebook retailer? Why give most of the added value to other etailers? 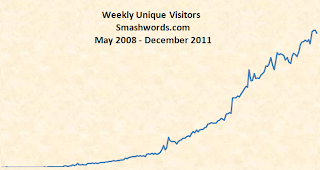 Wonderful and inspiring story of Smashwords growth in 2011. Now things are building for a hugely successful 2012. Mark, I note your remarks about Amazon. As you know my own experience with them hasn't been good. They want to rule rather than share. Now that you've got the publishing and distribution under control lets hope that 2012 sees Smashwords offering more marketing help to Indie authors. This may be the final battlefield in the eBook publishing saga. Whoever, finds the most effective way to capture the hearts and minds of their readers will rule as king. Lets go for it in 2012. Mark, I love it when you talk revolution! Thrills me to death. To the barricades, writers! It sounds like another amazing year ahead Mark. Thanks for all you do for indies. Smashwords, another disruptive technology, now does for e-publishing what LuLu, Blurb, and CreateSpace did for print-on-demand... watch this business model get traction and take off! They get it. Who could have imagined three months ago that a retired woman living in a backwoods town in Burgundy, France, would be able to publish works internationally? Happy was the day I stumbled upon Smashwords and I can only hope that 2012 will bring as many wonderful moments to the Smashwords family as they have brought to me. Happy New Year 2012 and beyond!! Thank you very much Smashwords for all the hard work! I'm just getting started and can't wait to see how far I can go! Looking forward to working with Smashwords in 2012 and beyond! Keep it up! Happy New Year, Smashwords! May 2012 be good to you. I can remember when I started researching self publishing in late 2008/early 2009 and there was a terrible stigma - as if authors should be embarrassed that they wanted to do it their own way. It's amazing to me how much it has grown since then! Mark, thank you for Smashwords -- a great service for authors. I've been a self-publisher since the 1980s -- not vanity, but true self-pub with my own ISBNs and 10,000 books at a time in my garage. E-books have been a great boost for self-publishers and Smashwords Premium Catalog helps a lot. We have our books on Amazon KDP, but will not join the exclusive library program Amazon is pushing now. Keep up the good work and best wishes for another banner year in 2012. Thank you Mark for Smashwords and all the hard work in 2011 to grow the business and ensure profitability. When I joined Smashwords in 2008, I did so because of your emphasis on distribution not just publishing, and you have not disapointed. Although my sales have been modest, I still have great ambitions, which I know can be realised through Smashwords. Thank you. I enjoyed reading this report. I am a loyal Smashwords author. Thanks for doing what you do! Mark, allowing us writers to upload our preformatted EPUBs will make life so much easier for everyone. Bless you!